1) Prepare your Frame - I started with pink, of course! I spray-painted a metal filigree frame found in a...you guessed it...thrift store. These are readily available in a variety of materials and styles. If you're going Victorian, get as frilly as you can find. 2) Prepare your Background - Next, scrapbook paper was mounted atop the cardboard frame insert. I used a gentle mist of spray adhesive and then roll it with a rolling pin to prevent bubbles and wavy sections. 3) Prepare the Pop-Up Insert - For the base of the collaged art piece, I used a piece of mat board cut a few inches smaller than the frame. Using an exact knife, I gave a scalloped edge to the top. I then mounted a piece of pink striped paper and used a gold paint pen around the edges. 4) Add Your Design Elements - Now for the fun part. Using a variety of illustrations pulled from gift books, poetry books, Victorian books, gardening books and such, I built a collage. I cut out the various elements and then shuffled them around until I found the effect I wanted. It looks almost like one piece, but there are dozens of elements used. 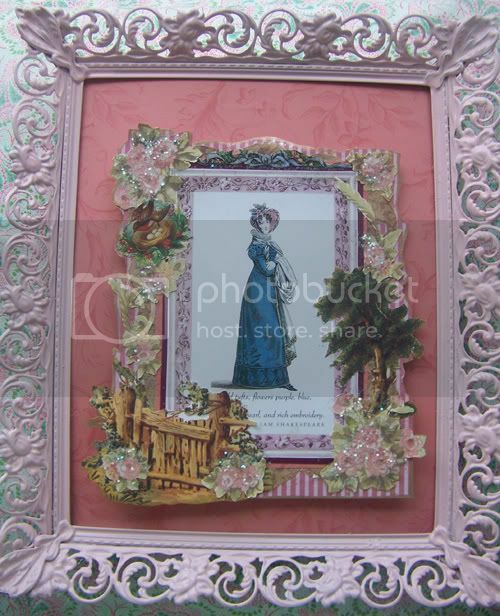 The center Victorian lady was mounted on about three layers of increasingly smaller papers. This piece was then mounted using foam dots to make it stand away from its background and provide a dimensional effect. 5) Guild the lily - Add sparkle and glitz by adding glitter and rhinestones to key elements. Don't forget the back of the frame. Cover it with a pretty paper or vintage sheet music as well. Add a pretty gift label, sign your artwork on the back along with a Mother's Day Greeting. Add a pretty French wired ribbon hanger.